I had a terrific long weekend! Passover Seder on Saturday, Easter on Sunday, and Patriots’ Day & Dyngus Day on Monday. 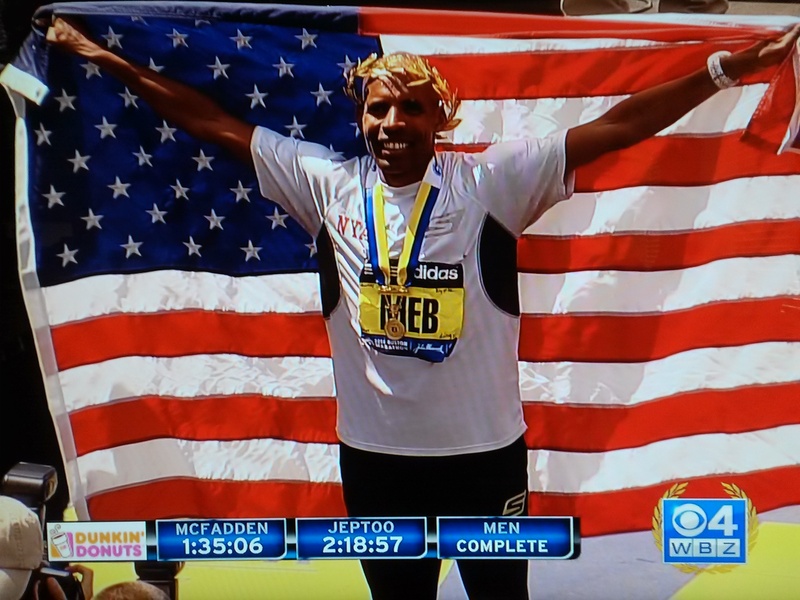 It was a great weekend filled with family and food, and it ended with Meb’s awesome performance at the Boston Marathon! In my opinion, there couldn’t have been a better result for the men’s race. I was literally jumping for joy in my living room when he crossed the finish line. This is a picture I took of my television. I still have the entire race recorded. I plan to watch Meb’s last 3 miles before every distance race I ever run for the rest of my life. Anyways, enough talk about my fail proof plan for getting into Boston, I have more pressing things to think about right now…it’s RACE WEEK! There are 4 full days, and only 2 easy runs until race day; and I’m not obsessing about the race at all. HA. Race day strategy is pretty much the only thing I can think about. I’m having a huge internal debate on whether I should run by effort or shoot for specific paces every mile (obsessively watching my pace). On the one hand, the former sounds much more enjoyable and I’ve done well running by effort in the past. On the other hand, I’ve never run by effort with a time goal before, and how can I be sure I’m running fast enough if I’m not checking the watch…obsessively? This weekend I spent a few hours playing around with paces in a spreadsheet. Turns out that there is no way to run slower than goal pace and still make my goal. Odd. I wish that goal pace didn’t sound so fast. In the end, the spreadsheet just proved what I already know – I need to minimize my number of “slow” miles, and for every slow mile l need to make up for it with a fast one. Good to know, but the fast miles are so scary sounding. Unfortunately, this exercise stressed me out a bit. I was feeling more confident when I wasn’t analyzing exactly how fast I need to run every second of the race. While that’s not a great side effect, it did help me understand the effort that will be required to reach my goal in this race. I will need to be outside of my comfort zone for a good long time. After spending all that time analyzing paces, I’m still not sure I want to watch my watch so closely, and I’m leaning towards some combination of running by effort and watching the clock. My current (this could change at any minute) plan is to “take it easy” for the first 3 miles and only look at my watch for distance. Then I will start speeding up and settle into a “comfortably hard effort.” Once I get a rhythm going, I will start checking in on my time/pace. I’ll continue in this mode until around mile 10/10.5. From there, “full speed ahead”. Ideally, these efforts would translate into 9:15 pace for the first 3 miles, followed by 9 min pace for the next 7 miles, and then faster than 9 for the last 5k. The main thing I worry about in the “run by effort” plan, is that I will run too slowly in the first part of the race and will never be able to make up the time. Logically, I know this is ridiculous. I always have to chant “slow down” and “take it easy” at the beginning of long runs and races in order to ensure that I don’t go out at some insane speed. I have never seen my first mile time in a race and thought “Gee, that’s too slow.” I usually wonder if my watch is broken because it’s clearly showing an impossibly fast time for what feels like an easy effort. I also think that any extra time I take in the early miles will pay off in the late miles. I read something once that said that every single world record race time was achieved with negative splits. I could debate about this with myself for hours. Actually, I have. I’ve been thinking about this too much, and and sadly I’m probably not done thinking about it yet. At least I’m closer to a decision than I was over the weekend, and I think my hybrid plan might be the right one. I’ll let you know what I decide. Do you obsess over race strategy? Have you ever run by effort in a time goal race?